Are Non-Navigable Waters Covered By the Clean Water Act? I'm trying to follow a series of court cases and Ohio state laws that could have a big impact on the future regulation of Ohio's navigable and non-navigable water ways. Strictly interpreted, the CWA only covers navigable U.S. waterways. At issue are two Supreme Court cases--Rapanos v. U.S. and Carabell v. U.S.--that ask the Supreme Court to decide whether the Clean Water Act extends into tributaries and wetlands that flow into navigable waterways. At the same time, three Ohio state senators have introduced legislation to hold state environmental standards at federal limits--call us AntiCali. An odd coalition of advocacy groups, sportspersons and businesses are banding together to fight the legislation. If passed, many current regulations on Ohio wetlands would be rendered ineffective. Here's the full story from the Columbus Dispatch. Americans are overwhelmingly opposed to a higher federal gasoline tax, but a significant number would go along with an increase if it reduced global warming or made the United States less dependent on foreign oil, according to the latest New York Times/CBS News poll. The nationwide telephone poll, conducted Wednesday through Sunday, suggested that a gasoline tax increase that brought measurable results would be acceptable to a majority of Americans. A conditional agreement between Alaska and three big energy companies may be, as Gov. Frank H. Murkowski put it, a milestone toward building a natural gas pipeline. But significant political, environmental and regulatory hurdles must be overcome before a single section of pipe meets a welding torch. After prolonged negotiations, Governor Murkowski announced late Monday that Alaska had reached an agreement in principle with BP, ConocoPhillips and Exxon Mobil to build a $20 billion pipeline from the North Slope to the lower 48 states by way of Canada. As envisioned, the pipeline would move 4.5 billion to 6 billion cubic feet of gas daily and begin operating sometime from 2012 to 2014. Alaska has an estimated 35 trillion cubic feet of gas reserves. But, as the title of the NYTimes article indicates, don't get excited just yet. The Mid-Ohio Regional Planning Commission (MORPC) is "a voluntary association of governments serving Ohio. A catalyst for regional change, evidence of MORPC's work is seen everyday through planning, programming and brokerage services in the areas of housing, transportation, water, land use, zoning, environmental and technology issues." Recently, MORPC laid out it's plan of how central Ohio SHOULD grow over the next 25 years. That plan is illustrated in the graphic to the right**. The problem? Leaf blowers, the most efficient way to keep lawns and sidewalks Desperate Housewives-immaculate, are a bane to both the air and the ear. In the Los Angeles area, home to a thriving landscaping industry and one of the worst smog problems in the nation, the regional air quality agency is offering cleaner, quieter machines at a discount to landscapers who turn in old ones. The agency said the trade-in was a good alternative to leaf blower bans, which some cities adopted but which can be difficult to enforce. Officials from the nearby city of South Pasadena contacted the agency for help after repealing a gas-powered leaf blower ban a year ago because of the number of complaints about violations. Landscapers say that using electric leaf blowers or tools like brooms and rakes takes more time and raises costs. In Fire's Wake, Logging Study Inflames Debate University Study Challenges Cutting Of Burnt Timber, by Blaine Harden, Washington Post: If fire ravages a national forest, as happened here in southwest Oregon when the Biscuit fire torched a half-million acres four years ago, the Bush administration believes loggers should move in quickly, cut marketable trees that remain and replant a healthy forest. Is Management of National Parks Headed Off-Road? Crossroads in the National Parks, Editorial, NY Times: The Interior Department has extended the period in which the public may comment on the National Park Service's controversial plan to rewrite the management policies for the national parks. The oceans are for the most part the world’s preeminent “open access” resources; that is, resources where there are few if any property rights, and where anyone with basic equipment can enter an industry and participate. This has led to the so-called “tragedy of the commons” scenario in many parts of the world where people over-fish and fisheries become severely degraded or completely collapse. 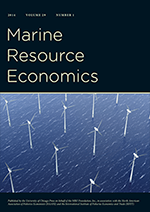 Economists have advocated creating property rights systems in which fishermen (and women) share quotas that are set and enforced at sustainable yields; this gives fishermen economic incentives to preserve the resource for the long-term, instead of getting as much fish as possible before someone else does. These systems have had some success in the U.S., Canada, Iceland, New Zealand, and other regions. As an environmental economist I should be applauding these successes and pushing for more of them (which I do). Something to commemorate "energy week"
Well, I made it to San Antonio (for the W-1133 meetings: Benefits and Costs of Resource Policies Affecting Public and Private Lands) safely and on time. As you can tell, I'm on-line also and John--it's free! Ok, it's included in the price of the room. I didn't have high hopes when my cab driver--with 13 years experience--had never heard ofthe hotel. But it turns out it's not bad. As for San Antonio, I don't have much of a feel for the city yet. I went and walked the Riverwalk last night and bought the required souvenirs for my kids. Had dinner at a pretty good barbeque place, but they were out of coleslaw. What's barbeque without coleslaw? Anyway, today is research presentations from 8 to 5. Here's what's on the agenda. I'll let you know if I learn anything tomorrow.